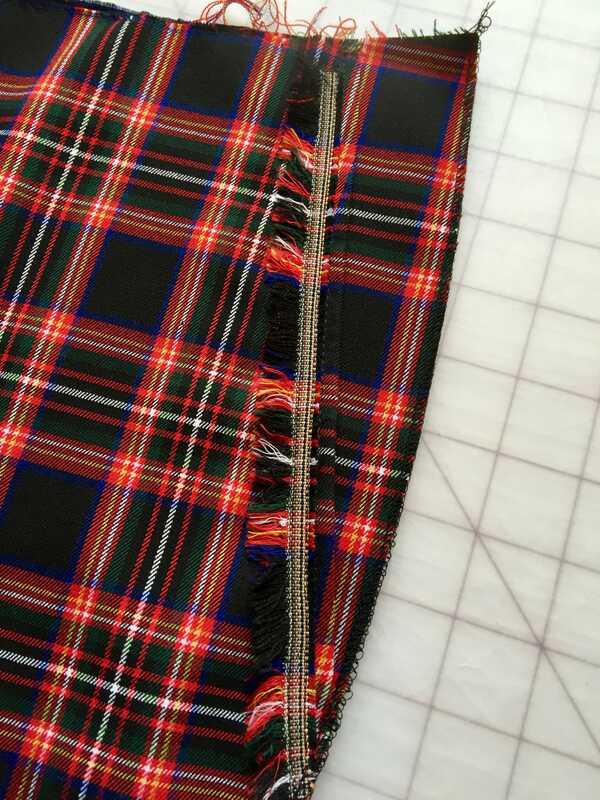 The pattern for these tartan trews were ripped off a pair of italian silk trousers – the ones accompanying the Diana top by In House patterns here. The only thing I wanted to change was the very strange square shaped waistband that stood away from the body. Makes me wonder if the designer had envisaged these sitting on the hips perhaps? Anyhoo, using Kenneth King’s Jean-ius – Reverse Engineer Your Favourite Fit, I draped silk organza over the pants and traced them off as best I could. Then, losing my way in the storm of organza, slant side pocket and crotch depth, I took the resulting pattern to Anita at Studio Faro for advice and tweaking. The pattern was drafted about 2 years ago and these trews made about 9 months ago! See, all the time I was showing you beaded thingamajigs, I was also beavering away on sensible everyday garments! Great discussion yesterday on Steph’s blog BTW, Steph’s quote from Alan Rickman is particularly thoughtful as were the comments. The last post was all about crotch curve and I’m afraid this is another below the belt expose! Just look at how shallow that front crotch curve is. Even less curvy than my personal pant block. I was experimenting with all sorts of fly arrangements, the buttonhole sits at the tip of the triangular fly extension – the button was sewn onto the inside of the waistband. At this point I should tell you how awful a bias cut waistband can be for your grey hairs! Something I’d not appreciated when designing these trews was how the bias would squish vertically making the waistband wider at the centre front. It was fully interfaced too, but still it grew in width, which is why the ‘under’ waistband at centre front peaks out from the ‘over’ bit at centre front. You do come here for the high brow convo eh?! So I ask you, how does one control a bias cut waistband or is the problem particularly bad on a curved waistband such as this one? Hating the shoes BTW, just looking at them in these photos reminds me that Princess is correct yet again. They have to go since they are neither aesthetically pleasing or happy on my ‘bad’ foot – jettison! Clearly I’m not comfortable with the waistband height, too hipster perhaps? It looks like I’m pulling them up at the sides to keep ’em on! There’s something about the length/width of the leg that doesn’t grab me about these – can you pick what it is? No, furreal, I’d love an opinion because its horribly unclear to me why I don’t love these. The fabric is a poly/lycra blend bought at Joy’s for a mere $7/m, so I’m not crying and this was meant to be a first try (better than a wearable muslin, but not as good as the lined woolen version of my dreams!). 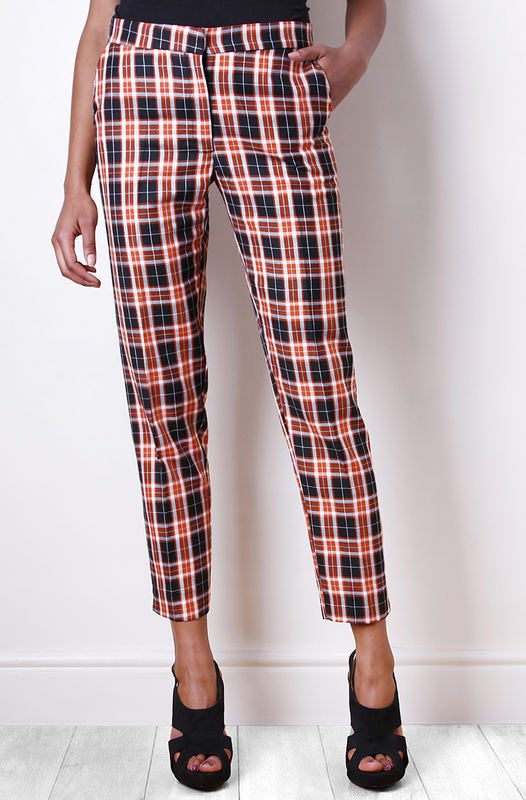 I love tartan trews and ever since the 80s punk era, I’ve always hankered for a pair for my wardrobe. The Grey Fox does them so bloody well it makes me green with envy! But then he appears to have ‘fine’ bone structure and little calf to speak of. Whereas mine jut out athletically, is that why I don’t love the verticals? Or is it hubby’s strange camera angle? Always safe to blame ‘im indoors since he never reads SNT!! Another excellent example… haha, call that a driver?! Another excellent example… haha, call that a driver?! 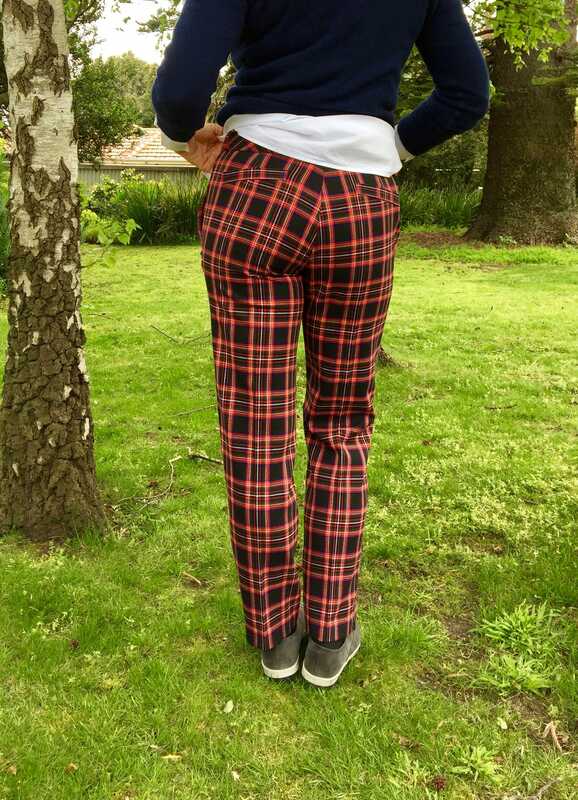 And not to be outdone, this wee lassie… Okay, I see the leg shape problem, her’s are looser all the way down (mine bind at the calf) and her cuff is wider allowing the pants to fall unhindered while mine are pushed up by my shoes. That makes mine look more masculine; men’s trousers often break at the shoe – ahah moment! Can you see anything I’ve missed? Oh yes, she’s probably 180cm, 55kg and has long slim legs – that could be it too! However judging by the jaunty angle of her great toes, I see bunions in this gals’ future – off to the podiatrist with you lassie! When I lived in Scotland I thought I could ‘do’ quite a convincing Scottish brogue, it has alwasy kept my kids amused. Imagine my comfuzzlement when I ventured into labour ward for the first time to a mother’s screams as her baby’s head was crowning “Ah wanna gan hem the noo” – loosely translated “I wish to go home right now”!! Mother and baby both did well! What about that selvage pocket edge though? Pretty and sturdy! Faux, nay lets call ’em fake welt pockets on the back. Less bulk, less work and thank goodness because I’m not head over heals in love with these trews. These are a prototype, just have to give the pattern some tweaks and give it another go, oh and ditch the shoes! 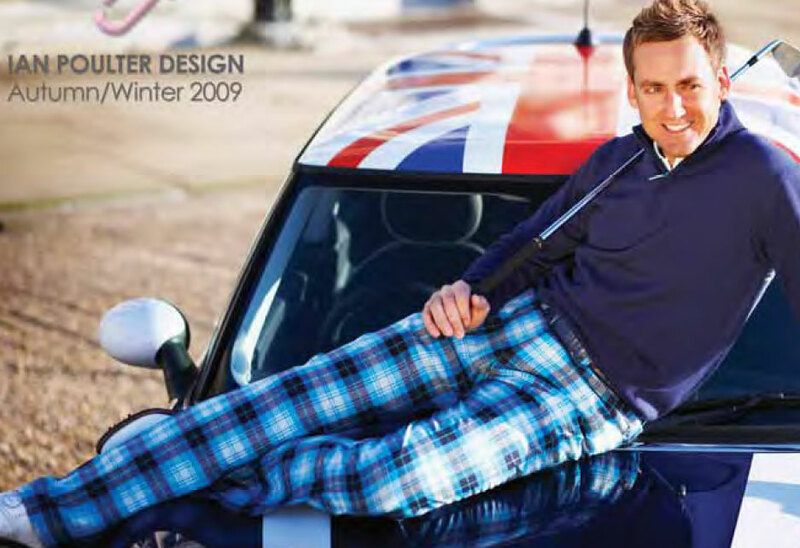 Lesley, This is hilarious as I am wearing plaid trews today! I have two pairs, but both of mine are ready-to-wear. To tell the truth they are kind of a “Signora” thing in Italy, but I’ve always liked patterned pants, so…I buy them from this little shop that buys from a small family run business that sews for Gucci. For leg length mine are slightly slimmer and end at the ankle with a vent. I’ll send you a pic if you like. Love yours though. A good prototype so far. Following the discussion yesterday I went away and realized that what I always wear (nearly always) and what I love is pants. My pants collection still needs some improvement so I was nearly late for work this morning because I tried on all of the pants in my cupboard! I think i need to start adjusting the back crotch curve slightly (extending it). Who knew? What’s the best way to do this? I need to know! PS mine are also medium rise, no pockets and side zip. And look great with heeled ankle booties…for when your foot is healed! Podiatrist appointment this arvo, I think he’ll prescribe orthotics – don’t they all?! Too funny – serendipity?! These do actually have a lovely little vent detail at the hem – though ‘the photographer’ neglected to capture that! I see in menswear it’s designed to allow the hem to sit lower over the shoe, it assists the break. Without getting “up in your grill” Steph, why would you consider lengthening the crotch curve? Your pants always look so well fitting. To complicate matters it could also be a move the crotch curve outward or inward issue! Anita recommends doing only a 6mm adjustment at a time since trouser curves can change dramatically at that. Not sure mine can be any slimmer or I’ll have to leave an outward bulge for my calves, pictures would be good! How about a pic of the innards too – love to compare and contrast! Ah..I totally missed the vents. Great minds think alike (yours and M. Ballerini)! I’m really going to go on a pants odyssey…and make that bustier, too. Re. orthotics I have always resisted. Not sure if that makes sense, but I never liked the idea of having running orthotics. THe runners I knew with them always got injured, I think because their gaits were altered too much (I have too much trust in the body’s ability to adapt, I guess). Best of luck! I like these pants! You’re right though, the shoes are pushing the hem and causing a break. Also right about that poor model’s poor feet. Haha, we should so start a foot clinic by blog!! On my way to the foot doctor by train and I’m wearing silver brogues – addendum, now in a moon boot – how the heck does one dress for that?!! You saucy devil Linda!! I assume with a shorter curve that the inseam must sit closer to the front than middle. Does your inseam sit more in the middle? Also anything with stretch has a shorter front extension though the silk originals had no stretch??? I think I am going to go back and re-read my comment…the one that gave me the “Saucey” label! My inseam sits in the middle. The front curve is just a bit curvier and the back curve is HUGE by comparison! That’s what I use for a woven anyway. 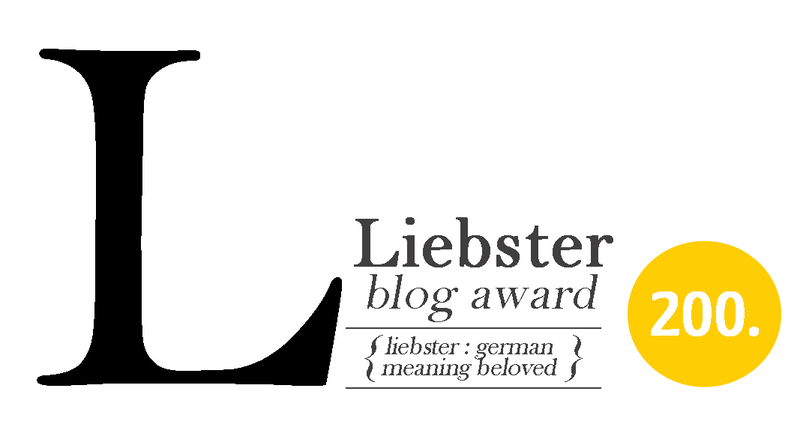 I blogged about it a couple of weeks ago. The stretch fabrics are still trial and error! You do such precise work with your fitting – I am envious! Any advice is always appreciated. I think these look fine and at least your tartan stripes match up! Excellent and wise Ruth. One cannot go wrong with new shoes!! The details in these are just awesome. I love the bias waistband and back welts and the fly extension shape is beautiful, if I may say so. 🙂 And how nice that your plaid matches at key points unlike that utterly horrid RTW pair on the skinny-legged tall model. *shudder* What where they thinking when they photographed that mess of mismatch?! Haha, isn’t it funny what we expect now that we’re in the know?! I do think pattern matching is quite important when using such a vertical/horizontal pattern. David Page Coffin’s Craftsy class provides inspiration as do hubby’s hand tailored trousers, Snooping inside menswear – so rewarding!!! Lovely trousers, and while not great with these pants those shoes appeal to me. Thanks Kate, the trousers are so easy to wear. The shoes were bought in Singapore as a foot saver in the humid heat; I think perhaps back in reality they’re a bit too big! I always read but seldom comment, but as I’m a similar age and on my own sewing journey with pants I’ve been thinking about your post. I think that objectively your pants fit really well (and are no doubt beautifully sewn) but that what you might be struggling with is that they are pants for real life on a real body and that what your eye might unconsciously be expecting to see is what the fashion mags, ads, Pinterest etc show us in all its long legged, bare ankle, high heeled glory. All of which looks very smart, but doesn’t work well for actually getting on and doing things. Hi Tracy, so great to hear from you and thanks for taking the time to comment. You’re definitely right, its not ever going to be a fair comparison is it! These photos were taken on the way out to lunch and I recall my foot was hurting, hence the shoes. The model shot by comparison probably took an hour to set up with lighting, hair, make up, model and photographer!! Ah the harsh realities of life!! Ruth is right. Just need shortening and change of footwear. Yours are so much better than the RTW pair – if I could get a fit as good as you, I would be delighted. 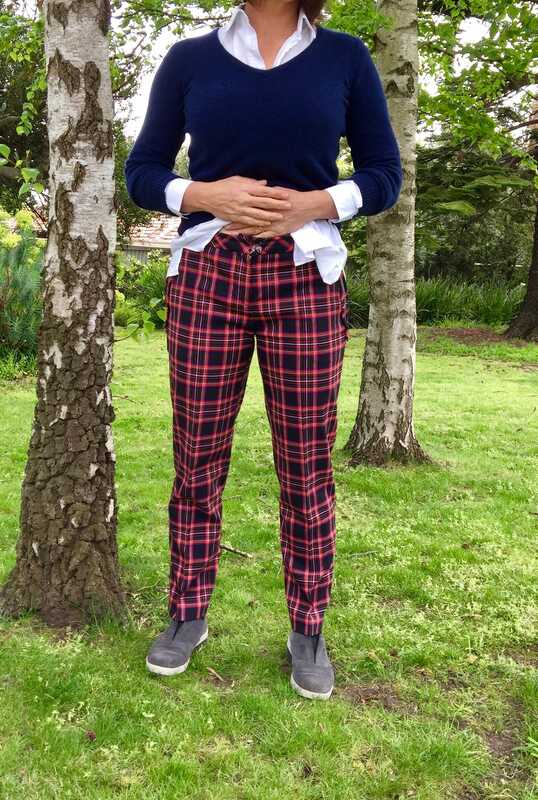 Also, Lesley, really liked your wide-legged trousers on previous post. Wish I could wear them. Sadly my legs are are just far too short, I would look ridiculous. These look great. I think your reluctance in them might just be that they aren’t quite what you were expecting. But they do look great. I think they are just a tad long for how you are wearing them. Try just folding the hem under a bit and see if that stops them being pushed up by your shoes and therfore bunching on the calf. Or keep them add they are with heels, if/ when your feet allow. As to dressing for a moon boot. I’d switch to leggings and skirts and if you have them, big boots on the other foot to balance it out. Haha, I like that, I’m kinda going with the liberated “whatever the heck I want” at present! Its kind of like, oh I don’t normally wear 1 crazy shoe and a moon boot, but its working for me at the mo’!! Cooler here today, I may just be able to drag these trews out for another try soon! 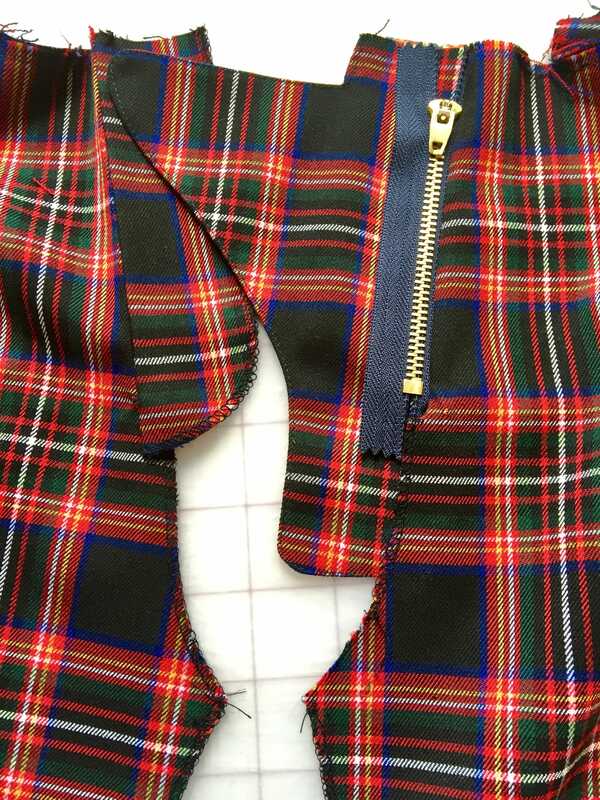 They say if you can master plaid pants you can sew anything. Well done! I was going to suggest wider legs to prevent them breaking at the hem/shoe but I think all of that has been covered. I agree with Tracy – we all compare ourselves unfavourably with magazine photos. The girl with the legs is wearing her trews ankle length, pin them up and have a look, I prefer a straight leg shape like this to be a bit cropped!Heels or no heels. Crotch shape looks good to me and wearing them slightly lower on the waist takes time to get used too?? Constantly living with that feeling of having to pull them up. However these low waistlines are sometimes helped by a skinny leg, where, I’ve decided, your calf or hip hold up the trews instead of the waist! I love the notching tool, its so surgical! Yikes, (late to the party)..plaid and pants!! ya know I’m impressed ( as always). You look great in everything..including the shoes! I also really like the wide legs…fun fun fun! Hi there Joyce, been busy? Us too, house selling! Comment appreciated at all timess, the party just goes on! Very nice! and I agree, shorten them by several inches to sit at around mid-calf like the length they are on the model you’ve pictured, that length is very elegant and is not so visually overwhelming as the full length leg. They look absolutely beautifully made! Yes, I think a shorter length would be tres chic Carolyn. Our home is auctioned today. With a bit of luck I can then go and retrieve my sewing gear from storage 👏🏼. What a relief that will be! !